The Honey Trees’ first LP, Bright Fire, has been in the works for four years. Four whole years! A lot can change and go wrong in four years, but luckily for us, this gap between the release of the duo’s Wake the Earth EP and this record was time well spent. Bright Fire is dreamy and hypnotic. Becky Filip’s angelic voice melds with rippling keys and cascading strings on the opening track, “By the River.” Jacob Wick, the second half of the duo, joins Filip in lulling us to vocal bliss. “Nightingale” removes us from wandering around the woodlands of a fairytale and brings us down the shore in the summer, boom box in hand. The surfer vibe and clanging drums are a definite change in sound, but we can tell how cleverly they’re crafted. The piano coupled with Filip’s vocals on “The Seaside” remind us of The Hush Sound. 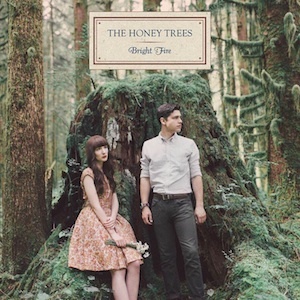 Overall, The Honey Trees present a sweet sound that soothes our souls.